Women aren’t the only ones wearing engagement rings anymore. Credit it to men who want to be fashion-forward, or maybe to men’s desire to have a symbol of commitment they can wear and flaunt, too. The bottom line is, the traditional proposal is changing with the times, and it’s changing to include men’s engagement rings. Alternative-minded couples may be interested in a man’s enmgagement ring, but might not know where to start. Luckily, bucking tradition means that you have the freedom to make your own choices, but it’s still nice to take some of the stress off by having guidelines to follow. First thing’s first, how much are you able to spend? You could go the traditional route and mimic the guideline of 2 to 3 months’ salary, which is what men have historically spent on women’s engagement rings. But these days, alternative couples are going outside of the box and choosing a budget that fits their lifestyle, instead of a budget that holds true to tradition. Some couples may choose to split the traditional budget between the two rings, while others may spend much less on either ring. Whether you’re looking to spend $500 or $5,000, just know that there are gorgeous and meaningful men’s engagement rings that suit every relationship. Whether the two of you value simple symbolism or extravagant gestures, this engagement ring reminds you of an important relationship milestone, one that you’ll want to remember forever; so choose the ring that’s right for your budget, but also right for the heart. Most partners don’t know their significant other’s ring size off the top of their head, so don’t fret if you have no idea what size your boyfriend is. Instead, think smart. You want to get the ring size right the first time and avoid inconvenient exchanges or expensive resizing. You could also ask him, but that may spoil a surprise you don’t want to give away! Borrow an old ring. Take it the jeweler, or even trace the shape on a piece of paper. Compare your hands. If you know your ring size, you can guess his size based on the difference. It’s risky, but will help you get a close approximation! Measure his finger in millimeters as he sleeps, and compare it to a sizing chart. Check out more creative ideas to find out your S.O.’s ring size. If you still don’t have any idea, pick a large ring size. If you’re the one popping the question, it’s better to slip a too-big ring on his finger, than not being able to get it on at all! Now that you’ve got the most critical information on hand, it’s time for the fun part. 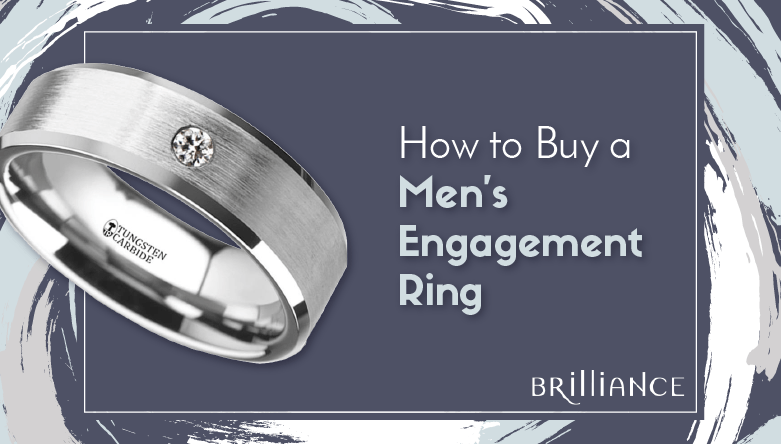 Men’s fashion is highly variable and personal, and men’s engagement rings are no different. The style you choose needs to take into account your boyfriend’s aesthetic preferences, his lifestyle, and any symbolism that is important to you both as a couple. This is important, so take the time to get it right. Luckily, it’s never been a better time to shop for men’s engagement rings. The market is positively saturated with cutting-edge designs, classic men’s rings, and unique men’s ring styles, so no matter what style is right for your fiance-to-be, you’re sure to find a ring that suits. 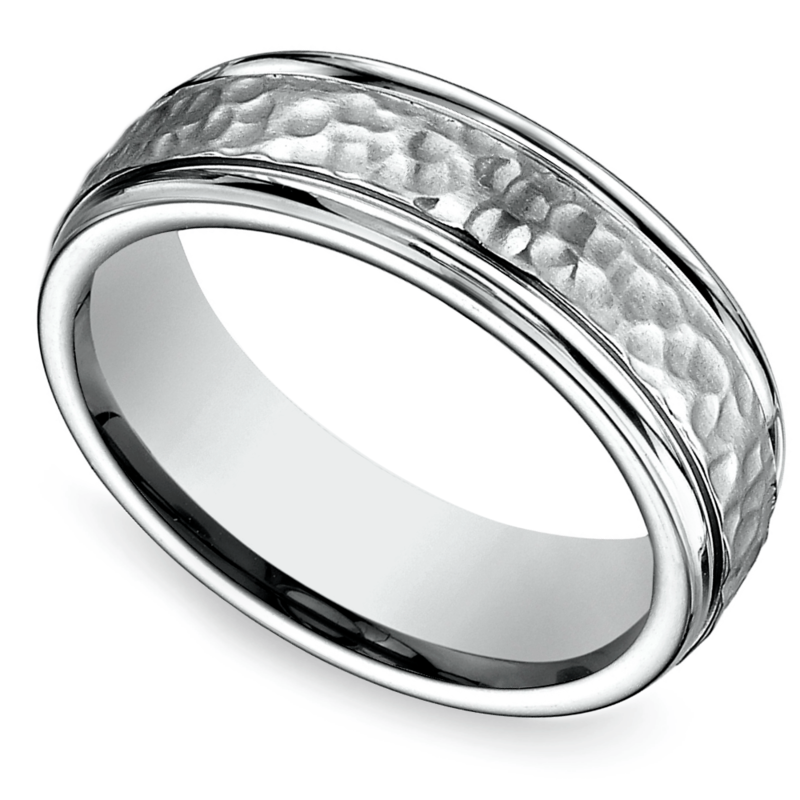 Similar in form to a wedding band, many “mangagement” rings have a round shape and little to no precious stone ornamentation. 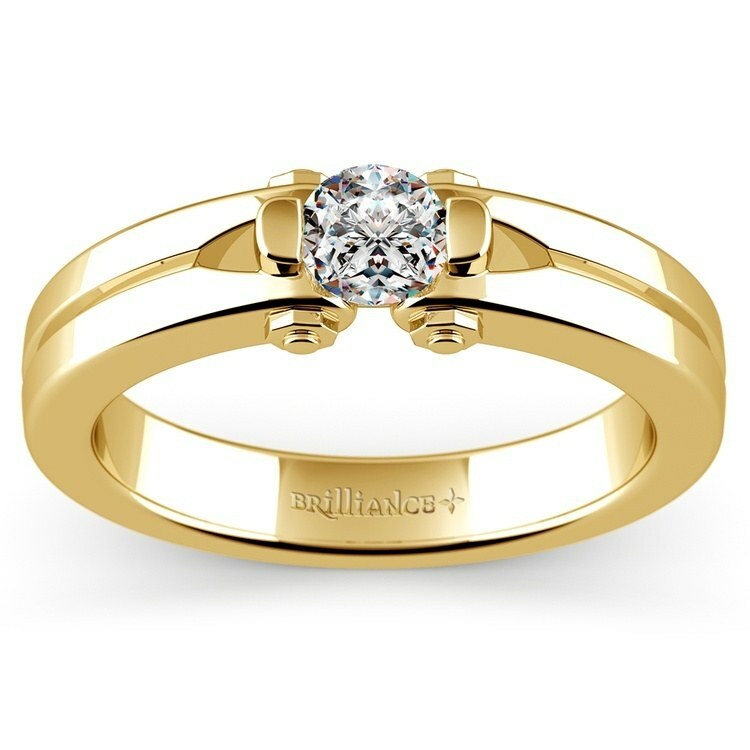 However, in keeping with the diamond tradition associated with proposals, small diamond stones are typically embedded in the band, in lieu of a traditionally feminine solitaire topper. In recent years, more men have been wearing solitaire men’s diamond engagement rings, so if you prefer the solitaire look, go for it! Men who have active lifestyles are typically not inclined to wearing rings, especially those with fragile settings. Men’s engagement rings in gold are gorgeous, but they’re soft and they could easily bend or get caught in the wrong situation. There are just too many opportunities to damage fragile precious metals when you’re rock climbing or working with your hands. The practical solution: go for precious metals that are more durable than the usual ones for rings. Titanium is one such metal: it is virtually indestructible, medical-grade, and hypoallergenic, to boot. Platinum is also a good choice, although it is quite expensive and requires a bit of buffing every now and then to get rid of slight nicks and scratches. Wearing an engagement ring is a personal and long-term act, so it’s only fitting to have a personal touch engraved on it. 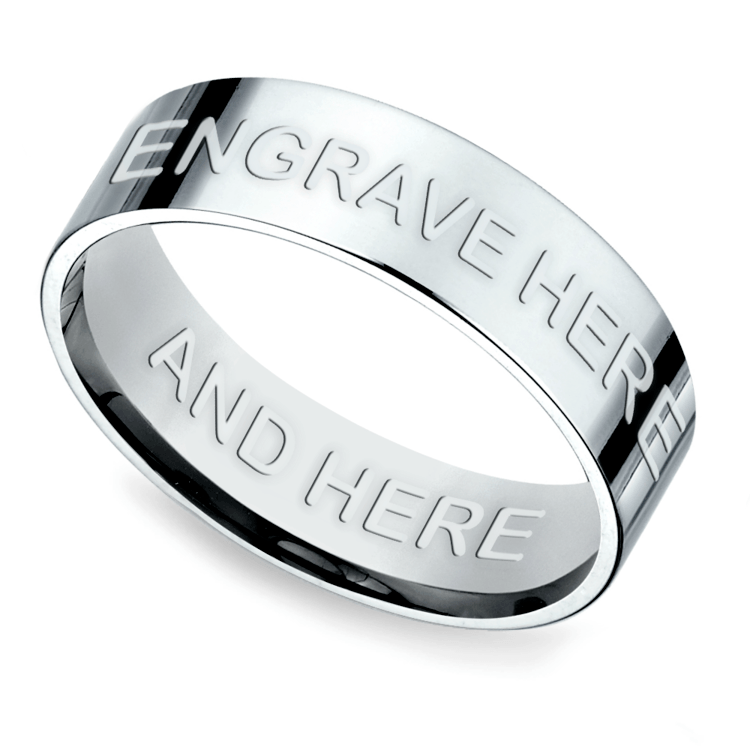 The date of the engagement, the names of the engaged couple, a favorite line from a poem, song, or film, and other important details can be engraved within or on the band itself. The same goes for symbols: many geeky couples incorporate such things as coordinates of their future wedding venue, or favorite superhero logos, for instance. As well, those who have artistic inclinations may have preferred patterns they want to integrate into their his-and-hers, or his-and-his, engagement rings. 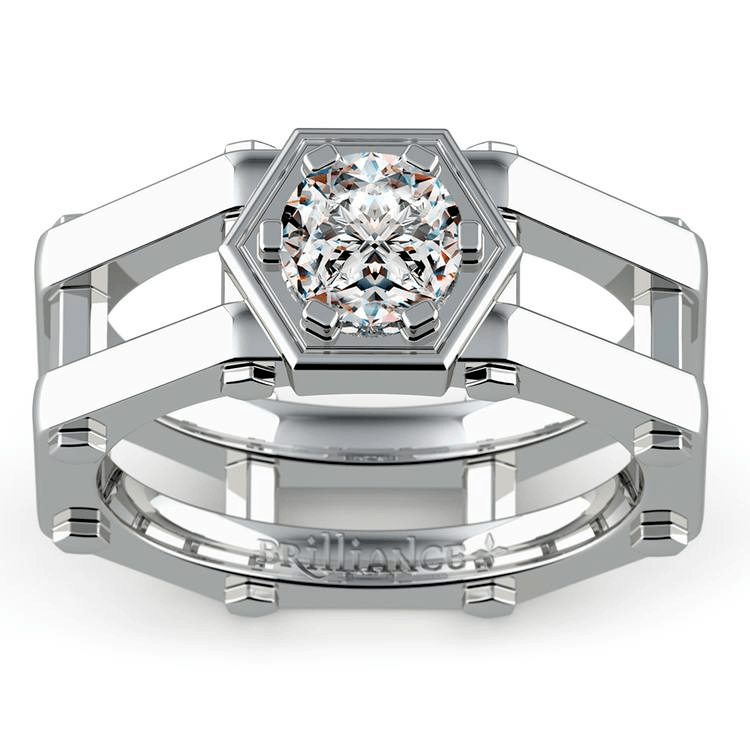 To add an edgy look to their engagement bands, a lot of men are opting to wear angular styles. Angular-edge rings usually have a perfectly round center for a comfortable fit, and very fine-cut edges to give a distinctive look. Many of these are created from a combination of precious metals. It’s a unique and very masculine aesthetic that makes a bold statement while declaring your love! Choose trusted vendors. When you’re dealing with diamonds and precious metals, there’s no cutting corners. At Brilliance.com, our reputation speaks for itself! Check for certifications. A certified diamond vendor should have all of the information available to you where it’s easy to see. You shouldn’t have to go digging for credentials. If you’re buying diamonds, ask if the rings come with certificates from the American Gemological Society. Find out about the return policy! You don’t want to find out too late that you’re a half-size off and your jeweler’s out of town and can’t resize. Get your ring insured, whether it’s through a personal home insurance policy or a third-party jewel insurer. You don’t want to take chances with such a meaningful piece. You’ve gone from asking “do men wear engagement rings?” to having the perfect ring in a box, tucked away, waiting for the right moment… or maybe it’s on his finger already. Congratulations! You’re on your way to starting the biggest journey of your life. P.S. Are you looking at wedding rings yet? It’s never too early!